Robert Sacre thought he’d found the ideal team and place to continue his basketball career. The Louisiana-born Sacre was in training camp with the New Orleans Pelicans, home of his beloved Saints and numerous friends and relatives. Team Sacre – wife Vinessa, son Quinton and daughter Anastasia – made the move, too, staying with his relatives as Sacre prepared for camp. “It was perfect,” Sacre said. Unfortunately, his foot wasn’t perfect. The former Gonzaga player had a painful bout with plantar fasciitis, an inflammation of a band of tissue that runs across the bottom of the foot. He was waived in October after being limited to one appearance in a preseason game. Team Sacre returned to Spokane. Sacre worked out at Gonzaga, his foot healed and his next move came into focus. Sacre leaves this week for Japan. Sacre declined to identify who “they” are because the team hasn’t announced his appointment. It’s believed he’ll join former Zags teammate Ira Brown on the Tokyo-based Hitachi Sunrockers. Ex-Zag forward Josh Heytvelt has been a Sunrockers standout, but he hasn’t played this season. He’s been in Spokane recovering from a knee injury. 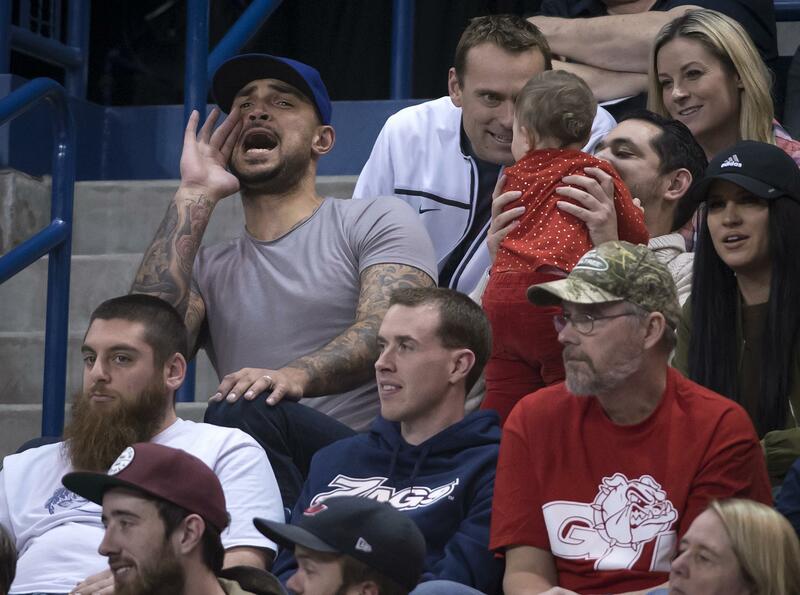 Sacre’s affinity for Spokane and vice versa began shortly after he arrived in 2007 and it remains strong. The animated, affable 7-footer has attended several Zags games this season and fans often approach him to take pictures. “The sky is the limit for these guys,” Sacre said of the Zags. “Everyone knows their role and they’re not trying to play outside their role. It’s a fine-tuned machine. Sacre averaged in double figures in his last three seasons at GU and he was named the 2012 WCC defensive player of the year as a senior. The Los Angeles Lakers selected Sacre with the last pick (60th overall) of the NBA draft. He played four seasons with the Lakers but wasn’t able to carve out a consistent role. He averaged 4.2 points and 3.1 rebounds in 189 career games. He played for four head coaches. Sacre’s tireless work ethic endeared him to teammates and coaches. It also prompted growth in his game. Sacre always hoped New Orleans would emerge as an option, but his foot injury left the Pelicans no choice. He wasn’t able to get on the court and the team had to move on. Sacre recently posted a picture of his office: the court inside the Martin Centre. His future office is about 5,000 miles away in Japan and when Sacre relocates, so does Team Sacre. “I’m just focused on this team in Japan, playing and winning the championship there,” he said. “Obviously, I want to get back to the NBA, but I’m in the moment and my focus is on Japan. Published: Jan. 3, 2017, 11:17 p.m.